3 ingredient, soft tortillas that are grain free nut free & vegan! Yes, that’s right! Three ingredients! and ready in about 15 minutes. Does it get any easier than this? 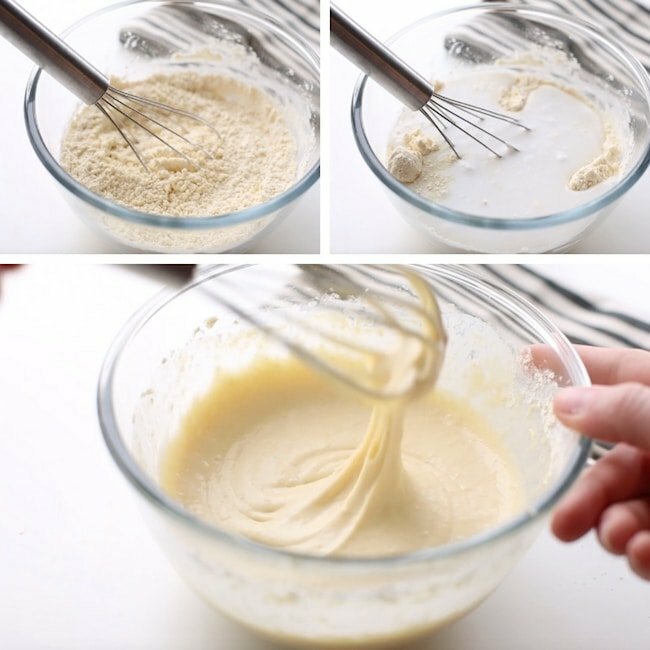 Whisk those all together in a bowl until you have a thick, pasty batter. At this point you can continue along with the recipe as is, or you can add a few things based on how you want to eat these. If you’re looking to use these in a savoury recipe you can always add in a little salt, garlic, etc. On the flip side you can also use these in a more sweet capacity as crepes/pancakes and throw in a little vanilla extract, cinnamon, sugar, etc. Once you’ve mixed everything together just pour the batter onto a hot plate/ non stick skillet, smooth out the batter as thin as you can go and wait a minute or two before flipping and cooking the other side. When little air bubbles appear on the top of the wraps as seen in the second picture below you’re ready to flip. Flip and cook on the other side and that’s it! This recipe is adapted from Heart Beat Kitchen Indian Naan. If you’re looking for something more along the paleo lines and you can tolerate nuts you can always try her recipe which is essentially just this recipe but with almond flour instead of chickpea flour. You can roll this up, fold it over, and fill it full of whatever you want and you’re good to go. This recipe is great to have on hand! These would be perfect the next time you make tacos, enchiladas or other types of wraps. Keep leftovers in the fridge for up to a week and reheat in the microwave or in the oven on a low heat for a few minutes to warm though. You may also like to pair them with our Instant Pot Chicken Carnitas! If you try this out let me know how it went! 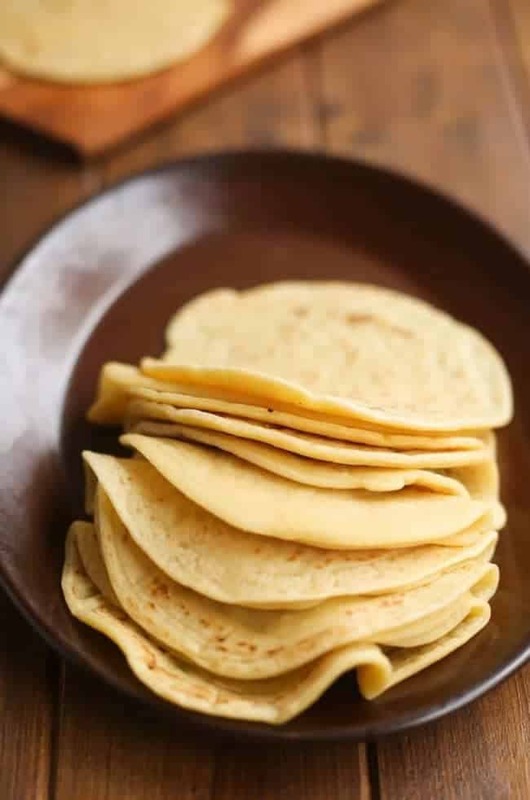 Don’t forget to #asaucykitchen on instagram if you try these grain free tortillas! We love seeing what you make! You can also post your pictures to my facebook page! In a medium sized mixing bowl whisk together the tapioca flour and chickpea/gram flour until combined. Stir in the coconut milk and mix until fully incorporated. The batter should be thick, but smooth. Heat a large non stick or well greased skillet on a medium heat. Pour about 1/4 cup of the batter at a time onto the skillet. Use the back of a spoon to spread the batter around into a large, thin circle about 6 inches in diameter. Let the wrap cook for 1-2 minutes. When the edges of the wrap are cooked and there are tiny air bubbles on top you know it's time to gently flip if over and cook on the other side for another minute. Transfer the wrap to a plate to let cool and repeat this process until the batter is gone. Store these in a zip seal bag or an airtight container in the fridge. They will stiffen in the fridge so you'll need to either warm them up in the microwave (about 20 seconds should do it) or leave them out on the counter to come up to room temperature before using. Make sure to buy 'gram' flour and not 'graham' flour. Gram flour is another name for chickpea flour whereas graham flour is a variety of wheat. Taste is excellent. I have to use only 1/2 cup of coconut milk to become them more bread-like. When I use 1 cup it is more like a pancake? I like them so much I eat it just plain! Thanks Caroline! Glad you like them! I do like the sound of thicker, more bread like wraps! Can I use arrowroot flour instead? Absolutely! Hope you like them! Wow, I just made these tonight for fajitas. They were fantastic and my husband even liked them! I used almond milk instead of coconut milk and found it needed a couple more tbsp of flour and tapioca starch. I love how pliable they are and don’t break! Will be making these a lot as I find it difficult finding good gluten free wraps that don’t break and have all of the added garbage ingredients in them! Thanks for sharing! So glad to hear that! Thanks so much for coming back to share what you thought! Thanks for the easy recipe, and I like the person’s idea who commented that these can be sliced and used as a substitute for pasta. That is an easy way to have two different dishes from the same recipe. Thanks! I’m on the Plant Paradox diet and these (with almond flour instead of chickpea) are my staple tortilla. I use Trader Joes organic canned coconut milk (no sulfates). I love that I can make large tortillas that are pliable and can be used as wraps/ tacos/ burritos. I love them with almond butter, too! Yay! Thanks Anne – so glad you like them! I agree. These are fantastic. Followed the recipe and added 3/4 tsp salt, and 1/2 tsp garlic powder. Served as fajita wraps. Also spread one with almond butter and sugar-free jam. Such a treat! Will have these often. Thanks Christine! Glad you enjoyed them! If you slice these into noodles, drop them into boiling water they are a great sub for pasta or egg noodles. Ooh I love that idea! Thanks Bob! Do you think you could freeze them? Or freeze the dough? These were really good! Thank you for sharing this recipe. Thanks Jenn! Glad you liked them! I was so excited to find this…then I realized I had Quinoa flour, not Chickpea flour :(. Would Quinoa and Almond Flour mix well together? I am new to making things Gluten Free and have not had much luck with the different flours. It’s very frustrating and expensive to experiment. Thanks for the recipe and any help you may be able to give. Hi Holly! I’m afraid I’m not too sure about the quinoa flour – I’ve never actually used it myself before so I’m not familiar with how it works. Sorry I couldn’t be more help here! I made these and they are SOOO good!! I’ve been using frozen rice flour tortillas and this were ok but these are so much more like a real tortilla but pillowy like a bread. I really really liked them. Thank you for this recipe. It is also very versatile, I ran out of tapioca flour so I just used a gluten free flour mixture, although it wasn’t as thin they were still delicious. I used them for enchiladas and they turned out great!! That makes me so happy to hear! Thank you so much for letting me know what you thought – so glad you liked them! These turned out great!! Both my kids and I were very pleased. I made them for my homemade hummus. Thank you!! That’s great! So happy you and your kids enjoyed these! Thanks so much for taking the time to come back and let me know what you thought! Can you use 1:1 flour instead? You are so patient answering all of those questions! I can’t wait to try these! Thanks Connie 😀 I know cooking can be intimidating for people – especially when it comes to making things gluten free so I try to be as helpful as I can! I really hope you love these as much as we do! These were really good and too easy. I was going to try them exactly like this, but I had some soaked lentils to use up, so I blended them with water to replace the milk, added salt and a little lime juice. Just yum. Thank you for sharing! Ooh I love that idea! Thanks for sharing! Just made these and they are delicious!! I haven’t had a tortilla in 10 years due to allergies, and these were perfect! I love that the coconut milk gives a nice flavor and helps cut the strong chickpea flour taste. These will be a new staple in our home, thank you so much!! Seriously! I haven’t had a wrap recipe turn out in the 4 years since I was diagnosed with a wheat allergy! It’s kinda ridiculous how easy it was to make a simple yet amazing, better than a wheat wrap! I used unsweetened almond milk cause I shockingly did not have coconut milk and I added a 1/4 tsp salt and 1/2 tsp garlic powder. The texture is almost on par with a wheat wrap, and it’s stretchy like a wrap aught to be. I just can’t say enough good things about this recipe. Thank you thank you thank you! I’m so glad you finally found a recipe that worked out for you! Not having god gluten free wraps was such a drag! Thanks so much for coming back to let me know what you thought, Teresa! I loved this! Definitely a need I didn’t know I had. My house has been gluten free due to my son’s allergy, so excited to add some more mexican food into our mealtime routine again! Yay! So glad you liked them! Hi Kathy! I’m afraid I’m not sure how it would work with spelt flour as that’s not something I’ve worked with. Sorry! What non-stick pan do you use? My husband has pku and cannot have protein. Could coconut flour be used in place if the chickpea flour? I was so craving a “bread”! I had all the ingredients and made them immediately and now I am devouring my newest discovery! Thanks to you Sarah! Thank you again! Thanks Karen! So glad you liked them!! I tried 2 different recipes yesterday and both were horrible. I found yours this morning… success! These are awesome. Thank you! Yay! Sorry you had to go through two bad ones first but I’m so glad to hear these ones were the ones for you in the end! Can i sub chickpea with cassava flour? Hi, can I use almond milk instead of coconut milk? These were terrific! I’m so excited as this is the first bread- like food I have made and liked since going vegan gf. And so easy!! I used almond meal as that’s what I had in place of garbanzo flour. They got harder to spread out in a circle in the pan as the pan heated more and more but it still worked. Love them. That’s so awesome – I’m SO glad you liked them! Thanks so much for coming back to share! These were good, more like thick crepes or thin pancakes than tortillas. Next time I will use a different milk as I felt the coconut milk overpowered the taste. I’m looking forward to trying a sweet version of these!! Thank you! o glad you liked them! Thanks Diane! Yay! Made these tonight with soymilk, so a bit runnier than if I had used coconut. Poured them on parchment and baked a few minutes each side, at 350, no oil. I used them as a naan substitute for my falafel and was happy with them! These made 4 roughly 3-4 inch tortillas for me. Thanks for the recipe! Thanks so much for coming back to share! So glad you liked them!! I wonder if you can make the flours with whole tapioca, garbanzos and coconut in the high speed blender? I’ve never worked with whole tapioca flour so I can’t really say how it would go but if you try it would you let me know how it goes? This recipe is a heaven send!!! 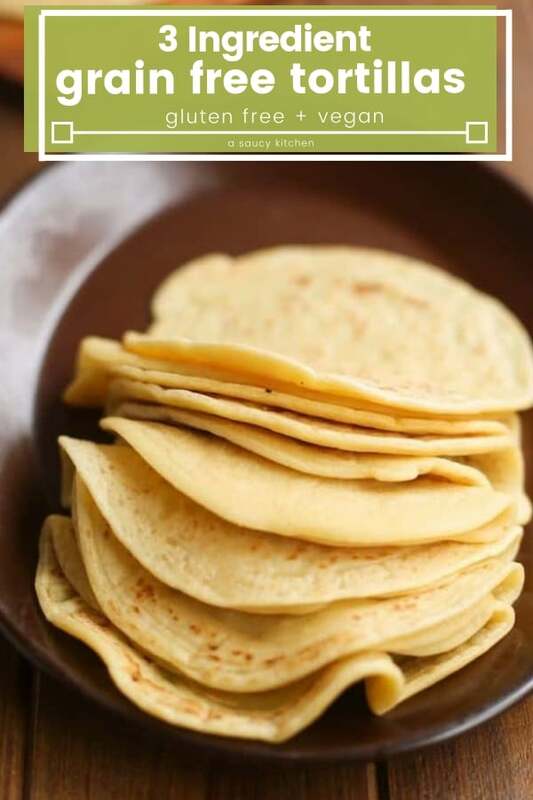 I have been using chickpea flour only to make tortillas, pancakes, coat veggies, or as a binder and I LOOOVE it but this recipe here will hopefully give me some flexibility in texture and taste..too excited to try this! So excited in fact that I am now a new subbie :-)! thanks for sharing your genius. The site seems to be full of yummy recipes that I can’t wait to dig into. I am a grain free, gluten free, vegan foodie that LOVES options! Thank you Jazz! That makes me so happy to hear! I really hope you like everything you try! I tried this recipe today and I didn’t like how sticky/ gooey they came out. Should I try less tapioca flour? Needless to say I didnt like it. A fantastic looking recipe that I can’t wait to try for myself! I’m a new vegan food blogger, and I pinned this promising recipe to my Veeg.co Pinterest Gluten-Free Bread Recipes Board. Thank you for sharing! Oooh that’s exciting! Thanks Rennee! Would i be able to use 1 cup of tapioca flour and no chickpea flour? I don’t understand, if recipes with too much/only tapioca flour tend to come out with a very strange chewy/gummy texture then why would you recommend using only tapioca flour here? Oops – sorry about that! That was a typo on my part – I meant to say that I wouldn’t recommend only tapioca there which is why I go on to mention almond flour as a possibility. Thanks for pointing that out to me so I could clarify! So glad to hear that they’ve been helpful on your vegan journey! Thanks so much for coming back to let me know what you thought! These were incredibly easy to make. For my first batch, I followed the recipe but it was a little sweeter than I wanted. I made dessert layering these with chocolate chips then covering it with leftover coconut milk mixed with mango chutney. It was delicious. For my second batch I used vegetable stock instead of coconut milk. Yum! I also baked it in the oven on 400 for five minutes. It turned out great. I’ll continue to experiment. Thanks for the recipe!! Ooh thanks for sharing that about using veggie stock – that’s really helpful to know! Really glad you enjoyed them! Thanks so much for coming back to share! Would a different starch work besides tapioca? Like arrowroot or potato? I have a coconut allergy, is there something else that I can use? Hi Heather! I haven’t tried freezing them myself but I do think that they will work to an extent. I think the thing that might be tricky is storing them carefully enough that they don’t break. When these get cold from the fridge they stiffen up and break pretty easily. Once warmed back up to room temperature though they’re back to normal with all of the flexibility it should have. Your suggested method of storing with parchment layers in between sounds like the perfect idea for this! I imagine it would be similar with freezing as it is with regular fridge storing – though that is something I still need to test. You advertise as nut free, but it’s not nut free. Coconut is a nut. It’s just less common of an allergy as the other nuts are. But family members of mine with nut allergies are also allergic to coconut. The reason why it’s listed as nut free here is because while it can technically be considered a nut it’s still considered safe for most people with nut allergies. My understanding (though I will admit that my understanding on this particular topic isn’t much) is that the proteins that people react to in coconuts are not the same proteins that trigger a reaction in nuts. So while you can be allergies to both conventional nuts & coconuts it’s not necessarily for the same reason and it’s definitely not as common. 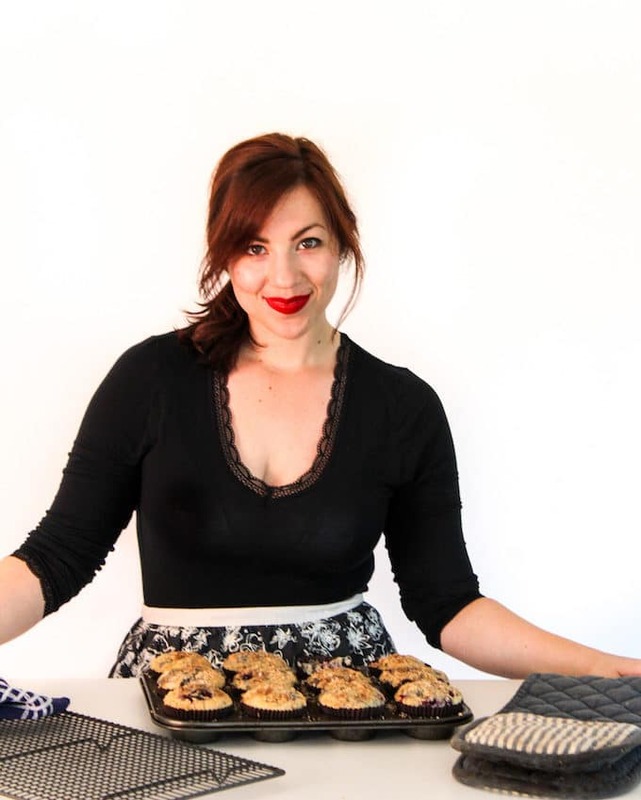 My goal here is to try to share allergy friendly recipes with people who may otherwise not be able to eat certain things and unfortunately there will still be some people who get left out sometimes. I hope that makes sense! I added 1 teaspoon of vanilla extract and some cinnamon, and they were perfect with almond-milk whipped cream and berries! Super delicious. Oh my goodness I love the sound of that! Thanks for sharing! Do you think that coconut flour could be substituted for the chickpea flour? I have to stay away from legumes so any suggestions would be helpful, Thanks! Hi Sarah! I am new here and can’t wait to try your recipes. My doctor told me to avoid gluten since it is making me feel bloated and it is also giving me migraine every time that I eat it. I hope you like what you try! If you ever have any questions on gluten free eating always feel free to reach out! Hi Kelly! I haven’t tried that out myself yet so I couldn’t say what the time time/oven temp might be but I do think that would work for these! I’ve gonna try that out myself soon – it would be sooooo much better than standing over the stove waiting to flip each one. If you try it out could you come back and let me know how it went? Kelly: Can you share information on the pancake recipe used along with baking information- temp and time? Thanks! This is an absolute game changer! Coming from an Indian household, being diagnosed as a celiac is an absolute nightmare. Most of our dishes include flatbreads – this is the closest thing I have gotten to that familiar flatbread feeling and taste. I used ordinary milk instead of coconut milk, added a dash of oil and a sprinkle of salt – brilliant! I love the fact that it is soft and “rollable” which is the most difficult thing to achieve on a gluten-free diet. That makes me so happy to hear – I’m so glad you guys like them! Thanks for sharing that note about the milk – it’s always helpful to know what variations work in case anyone else comes back to ask. Thank you also for coming back to let me know what you thought! Ooh I’ve never tried yam flour before – gotta find some! Thanks so much for sharing! Can I replace the chickpea with brown rice flour? I’m gluten free and also on a candida diet that doesn’t allow the tapioca flour/starch, it doesn’t allow any starches at all. Is there a substitute I can use in place of the tapioca flour? I haven’t tried this out myself but I have a feeling you might be able to get away with using more chickpea flour in place of starch here. It will affect the overall texture but I *think* it might work. Could you use arrowroot powder? I believe it’s in the rhubarb family. Do you think all purpose gluten free flour would work instead of the tapioca and chickpea flour? Hi Jen – not too sure it would work here. Chickpea flour & tapioca are very binding flours which is why you don’t need to use any egg/egg substitutes here. I don’t think a straight gluten free flour blend would work bit if you do try it please let me know! could you substitute buckwheat flour for the chickpea flour? I’m not too sure how buckwheat flour would work here – chickpea flour is very sticky/binding that it. That being said – buckwheat flour is great in crepes & pancakes which isn’t too different from these so I think it will. I wish I could be more help! If you do try it please come back & let me know how it went! The same amount will work! I tried them tonight but only had carton vanilla flavored rice milk and carton coconut milk. So I added a TBL butter. That to add extra flour but they smelled yummy as they cooked on my cast iron griddle. Oddly enough, the sweetness went real well with the bbq I was eating. Tomorrow will heat one up and add some pie filling. Everyone in my family liked it! Ooh that does sound good! So glad you liked them! Thanks for coming back to leave a review! These are seriously awesome! 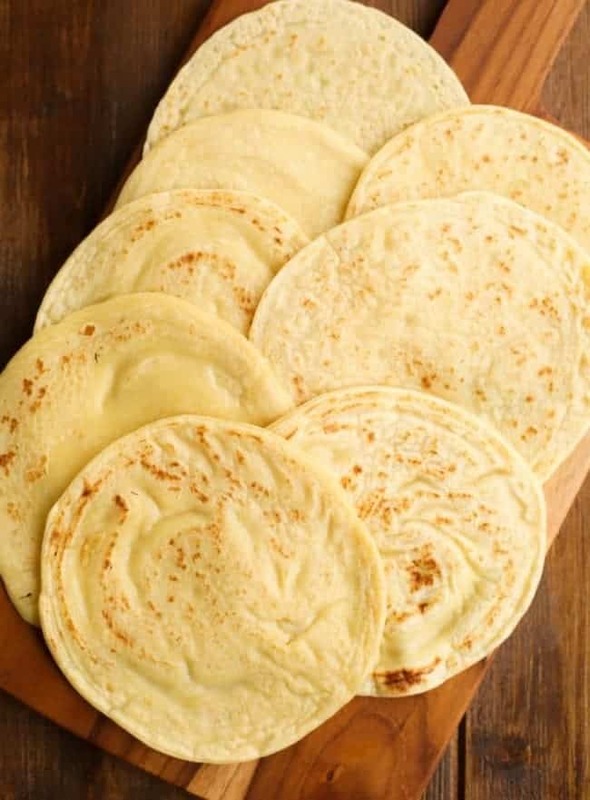 I have been looking for a good GF tortilla recipe after moving to Africa, (as you cannot find any GF tortillas on the shelves) and this is the winning recipe for sure! These taste great, work well and are very versatile. The only modification I made to the recipe was adding some garlic powder, onion powder and salt into the batter before cooking. I also use them in replacement of African “chapati” and eat them with beans and lentils! Thanks so much for a great recipe! Hi! Were you able to find tapioca flour where you are? Or did you substitute something? I’m in Tanzania and I’ve never seen tapioca here. I’m new to the whole wheat free flour world. Is there any way to use brown or white rice flour instead of chickpea or almond flour? I’m afraid I’m not sure how well rice flour would do in the recipe – I know that it’s more absorbent than chickpea or almond flour so the amounts of the other ingredients would need to change here as well. Sorry I couldn’t help more! I’m just wondering how these do with moisture… would these hold up as quesadilla’s, pizza bases, or as a wrap with cream cheese fillings? Both fresh and overnight in the fridge? As long as the things you adding to it aren’t too wet this should hold up pretty well – so quesadillas with cheese/cream cheese fillings would be alright, but I don’t think they’d work well as pizza bases. They can harden up in the fridge though so make sure you take them out and let them warm up to room temperature before eating otherwise they’ll break pretty easily. Would these work as a sandwich wrap for my son’s school lunch? Or are they better heated up? Hi Deb! That should be fine! Someone tagged me on instagram the other day showing off their meal prep for the week that included these wraps. As long as you’re not eating them straight from the fridge that shouldn’t be an issue. They get a little weird and firm up when cold, but once warmed up to room temperature they go back to normal. Is it tapioca flour or tapioca starch? If I use almond flour instead would I use just the almond flour or the tapioca with it? Also would coconut milk in a carton and not can work? Yes! Tapioca flour/starch are the same thing. If you’re trying it with almond flour then you’ll use that along with the tapioca. I use them with full fat coconut milk to add a little thickness, but I’ve had a few people saying that they used dairy free milk from a carton and they still came out perfect so. Hope you like them! These are absolutely fantastic. I was a bit nervous to make them – I’m in the habbit of ruining everything resembling a pancake – but they were so easy to make and so tasty. I love how they can be used for both savory and sweet recipes. Thank you for sharing! Thanks Debby! So happy you liked them and found them easy! could i sub arrowroot flour for tapioca? Made these twice now and my 3 year old loves them. She just ate one with salad inside, massive achievement for her. Madr large batch so i can keep them on hand for when she is having a picky food day. Thank you for sharing this. Definitely going to be a staple in our home. Do you think using Tapioca and Arrowroot flour be a reasonable substitute instead of the chickpea flour? I’m doing the elimination phase of AIP and can’t have chickpeas currently. I think to some extent it would work, but it would probably come out pretty gummy which might be a little off putting. If you can find cassava flour I recommend using that in place of the chickpea flour – it’s AIP friendly & is super versatile. I’ve only been able to play around with it a littleb it because it’s not easy to find in the UK, but it’s a pretty decent substitute for wheat flour. Also – a couple years ago my husband was on the AIP diet for a short period of time. I made him plantain tortillas and they were honestly so much better than I expected. They held up pretty well and were delicious. All you need is plantains and maybe a little salt http://www.wholelovelylife.com/plantain-tortillas/ Hope that helps! I have just tried these this morning. I substituted tapioca flour for corn flour at a ratio 2:1. They turned out really nice. It’s an unusual flavour but I like it. I really struggled with spreading them out in the pan as the mixture on the bottom lifted off the pan and left big holes. This means they aren’t really big enough for wraps. Any advice on how I can spread them more easily? Hi could you use these as a pastry substitute when making a quiche ? I can use coconut milk or almond milk ? How much can I use measuring by cups? I’ve never tried this with almond milk – I have a feeling that it might not come out the same since it doesn’t have the same amount of fat as coconut milk. As for the coconut milk you’ll just need a cup! Yep, it works with almond milk. And it also works with skinny coconut milk as well (the one that’s refrigerated). Same measurements. I tried them all and saw no difference. With the more watery milks, however, I let the mixture sit overnight in the fridge and it thickens up a bit more for pouring the next day. That said, it doesn’t appear to change how it cooks up at all whether the mixture is thin or thick. But it does make for better pouring and shaping in the pan. Hi Allison! Thanks for sharing all that – that’s really helpful to know! I made them with cashew milk, arrowroot and bobs red mill 1:1 gluten free mix. Came out perfect. That’s awesome Sharon! Thanks for sharing your adaptations – that’s super helpful! Have made these twice now. They work great. Taste much better than the store bought corn tortillas. Thanks for a great recipe. Thank you so much! Glad you like them & I really appreciate you taking the time to come back and leave a comment/review! Just made these. They’re wonderful, thank you so much!! Yay! So happy you liked them! Thanks for coming back to let me know how it went! SO glad you liked it! Thanks for coming back to leave a comment/review! That’s awesome! So glad to hear you guys like them 🙂 The only gluten free tortillas that I can find near where I live feel like plastic so I know your pain! Thanks for coming back to leave a comment/review letting me know how it went! Is there a substitute for coconut milk? I’ve haven’t tried it with any other milk yet so I can’t say for sure but you might be able to try it with another type of milk. Is there any substitute for the tapioca flour by any chance? Is chickpea flour the gram flour you refer to in the instructions? Hi Georgia! Graham flour is a variety of wheat, but gram flour is not – it’s just another name for chickpea flour. I can see how that might be confusing though so I’ll make a note so people don’t buy the wrong one! Thanks! I’m just starting to use coconut milk and notice the fat is always separate from the milk; do you mix it together before adding it to the recipe or just leave it separated and use the watery milk? I am Paleo so I can’t use chickpea flour any suggestions on replacement flour almond or coconu maybet? Almond flour should work perfectly! Hope you like it! Hi, How many will this recipe make? How would you suggest to store any leftovers, and how long will they be good for? I’m looking forward to trying these out.. they look so soft and moist! Thanks! hi Joanne! This makes about 8 tortillas that are 6 inches in diameter. I’d keep these stored in the fridge, but you may need to take them out to let them warm up to room temperature before using. If kept in the fridge I’ve had these last about 5-6 days. Hope you like them! Do you think I could make a large batch and freeze them? Take them out day of to use? It should make about 8 tortillas that are about 6 inches in diameter! Excellent! Thanks for coming back to let me know how it went!